If Russia is on your must-visit list, you don’t have to travel as far east as you thought. Squeezed in between Poland and Lithuania on the Baltic Sea, Kaliningrad is a small Russian province totally detached from the Motherland. It used to be part of East Prussia, and then Germany, until the map of Europe was redrawn after the conclusion of World War II. In 1946, Stalin expelled all Germans from the region and renamed it for a revolutionary, Mikhail Kalinin. Now, even after the dissolution of the Soviet Union, Kaliningrad remains under Russian control — though geographically fragmented from the rest of the country. Only 86 square miles total, with just under one million people, the enclave (or oblast) of Kaliningrad is easily overlooked as a travel destination — when scanning a map, you almost need to squint to notice Kaliningrad, sandwiched inconspicuously between two EU countries. But despite its size, Kaliningrad is an area of Eastern Europe that is well worth visiting, if only for its intriguing history and location. Here’s why you should add Russia’s forgotten province on your next trip. First, get the lay of the land (literally). The capital of Kaliningrad is a city by the same name, which used to be called Königsberg back when Kaliningrad was under German control. The city’s Bunker Museum is a good place to start understanding where you are. The museum is housed 23 feet underground in the bunker where German general Otto Lasch commanded the German defense of Kaliningrad in WWII. It was from this bunker that Lasch signed an order surrendering the city to the Russians in 1945. It consists of 21 rooms, and includes a recreation of the German surrender using models, original maps of the assault, and two films (in Russian) describing the battle. The museum is open seven days a week, and only costs about $2. Once you have a better sense of the area’s history, you should head to Kant Island, in the heart of the city. Until it was destroyed during WWII, the island on the Pregel River was home to Albertina University, located inside the original 14th century Königsberg Cathedral, where philosopher Immanuel Kant once taught. The cathedral was also fully restored and rebuilt in the 1990s, and Kant’s tomb is still located on its grounds. There is also a beautiful statue park on the island that’s popular with visitors. Enjoy a Russian beach vacation. 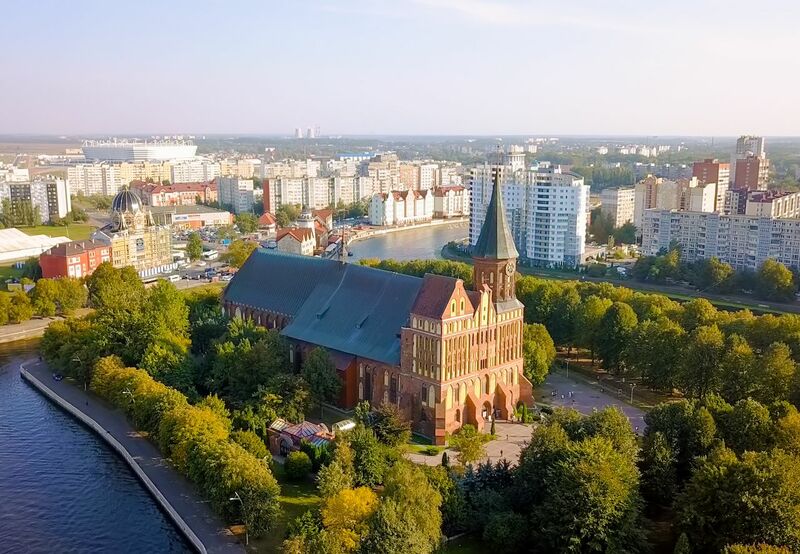 While you might not think of Kaliningrad as a vacation destination, it actually has some of the most scenic and relaxing resort towns on the Baltic Sea. About 26 miles northeast of the city, Yantarny has the nicest beach in Kaliningrad. It also has a seaside park and promenade. To the surprise of many, Yantarny is also the amber capital of the world. Ninety percent of the world’s amber is sourced from a mine here, and there are plenty of shops selling jewelry and other amber souvenirs. If you’re lucky, you might even find amber shards in the beach sand. Svetlogorsk, another seaside town, is also worth a visit. Just 13 miles east of Yantarny, Svetlogorsk was a resort town during the Soviet era, and its beachfront promenade is still quite busy in the summer. It is well-known for its Art Nouveau buildings, cafes, and beaches. Take a day trip to the Curonian Spit. 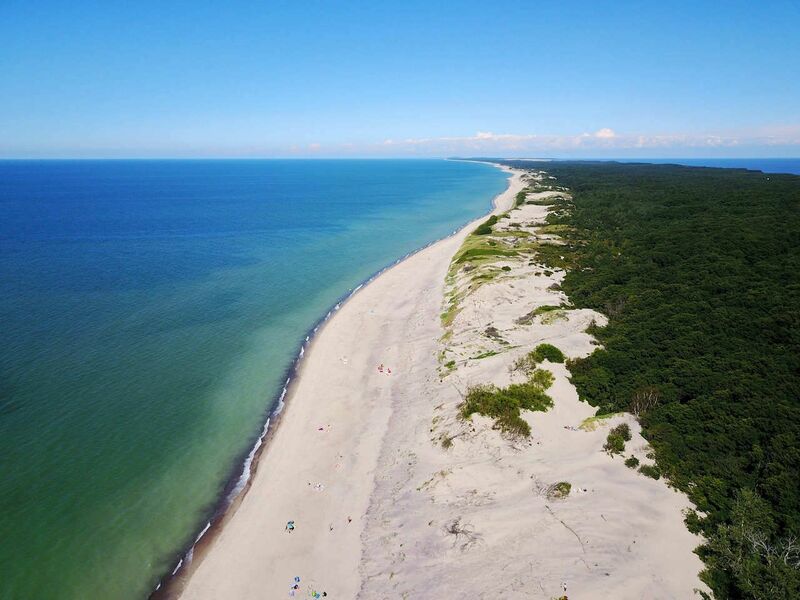 The Curonian Spit is a 60-mile strip of land beginning in Kaliningrad, crossing the maritime border between Kaliningrad and Lithuania, and rejoining land again in Klaipeda. This sliver of land is a UNESCO World Heritage site, filled with forests, hiking trails, beaches, sand dunes, and museums, and is 2.4 miles at its widest. 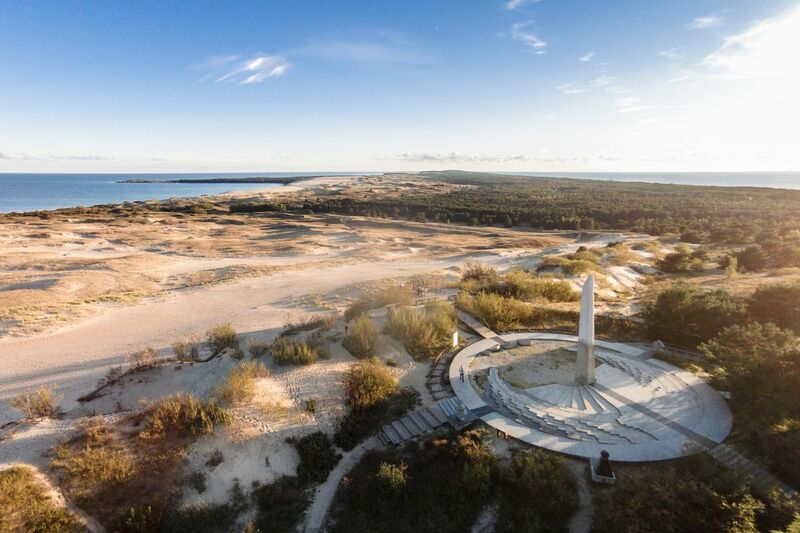 The summer season is short in the Baltics, but when the weather is warm, people from both Kaliningrad and Lithuania take to the Curonian Spit to hike, sunbathe, and enjoy incredible views of the sea. 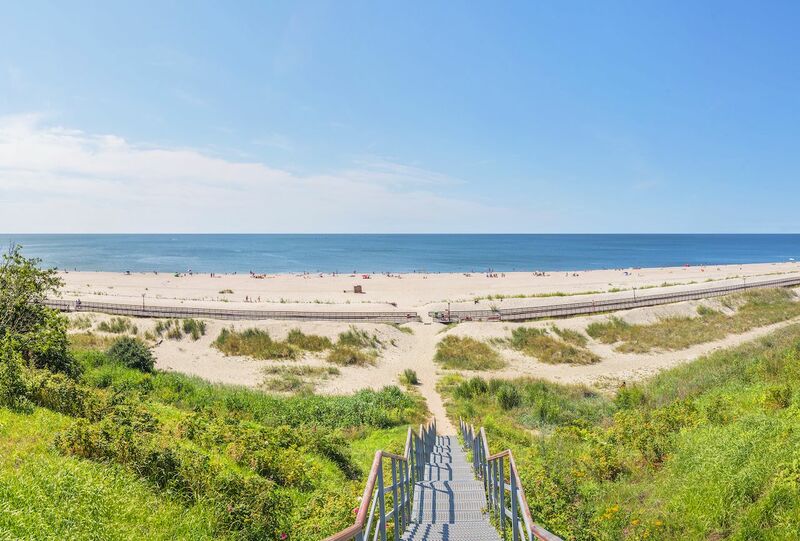 Pay special attention to the Parnidis Dune, the largest sand dune on the Spit at 164 feet high. At the top, after a hike, you’ll find a 40-foot-high sundial inscribed with runic and pagan symbols, and a panoramic vista of beach and sea. Brush up on your knowledge of architecture. One of the most intriguing aspects of visiting former Societ-bloc countries is the architectural aesthetic. In Kaliningrad’s capital, one of the most famous buildings is dubbed “The Monster,” because of its stark, almost robot-like appearance. After ordering the destruction of Königsberg Castle, Leonid Brezhnev planned to build the “House of Soviets” in its place — an office building meant to stand as a symbol of Soviet power. It was erected in 1968, but was never finished and remains abandoned. 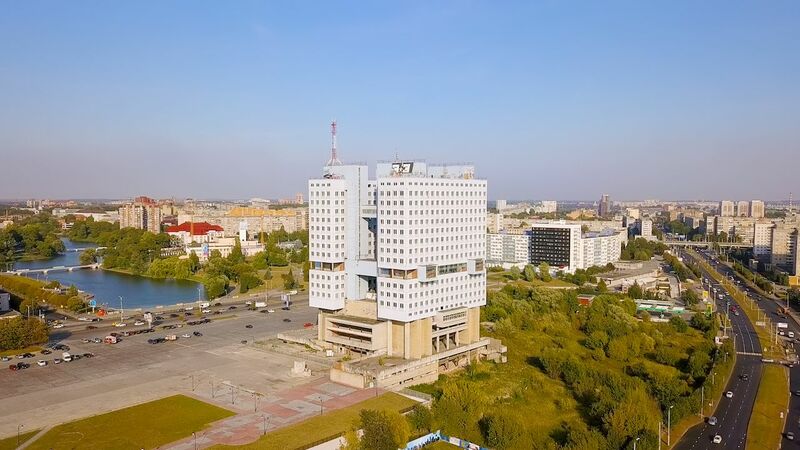 Although some may think of it as an eyesore, it serves as a reminder of the province’s Soviet past and is a textbook example of Brutalist architecture. Since much of Kaliningrad was destroyed in WWII, the enclave’s structures offer a blend of old, new, and restored. 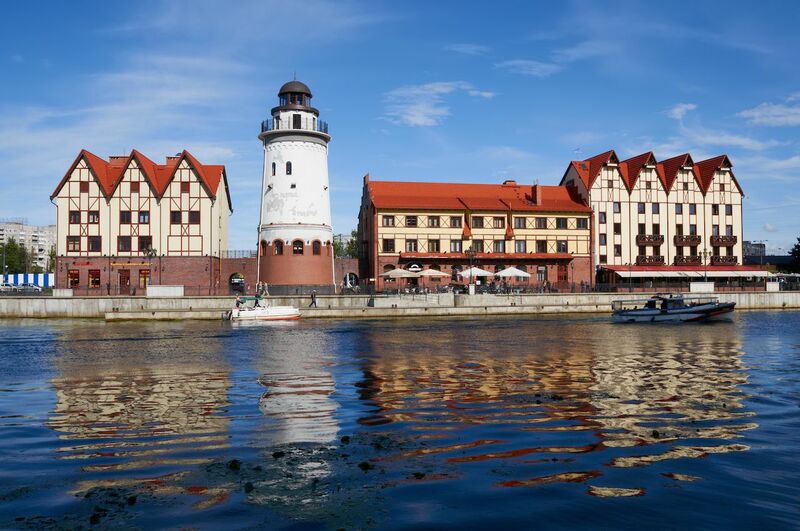 The city’s fishing village, for example, on the banks of the Pregel River, aims to recreate Kaliningrad’s pre-war fishing quarter, with German-style architecture and a 100-foot-tall lighthouse. The suburb of Amalienau, just outside the city limits, is a perfect example of the enclave’s Prussian roots. Originally conceived as a garden city, the roads are a maze of cobblestone alleys and open public spaces, with homes once belonging to the Kaliningrad elite. When you venture outside the city, there are also plenty of remnants of Kaliningrad’s Teutonic past, like Ragnit Castle in the Nieman District, the Lutheran St. Jacob’s Church in Znamensk, and Georgenburg Castle near Chernyakhovsk — all of which are from the 13th or 14th centuries. While Kaliningrad might have its own distinct character, the province is nevertheless part of the Russian Federation, and the same travel rules apply. It can be accessed by land either across the Polish or Lithuanian borders, or via air through the Khrabrovo Airport. If you are a citizen of the UK, Japan, or any of the Schengen countries, you can obtain a 72-hour Kaliningrad visa, which can be picked up at Braniewo or Bagrationovsk in Poland, or at Kaliningrad’s airport. You can apply for a visa prior to entering Kaliningrad, and then pick it up at any of the designated entry points. It costs approximately $80, with a processing time of just four to five days. If you don’t belong to one of the nationalities listed above, you must possess a Russian tourist visa. The process of applying for, and obtaining, a Russian visa is fairly lengthy and complex, with full information available on the US Embassy’s website. Once you’ve made it into Kaliningrad, you’ll be pleasantly surprised at how affordable it is. A beer usually won’t cost more than $1, taxis run from $1 to $6, an average meal costs around $7, and the average monthly rent for an apartment in the city center is just $255. So yes, if you’re not an EU, UK, or Japanese citizen, getting here might be a bit of a hassle, but once you do, your money certainly goes a long way.